Forests fill the air with more than just a fresh scent. 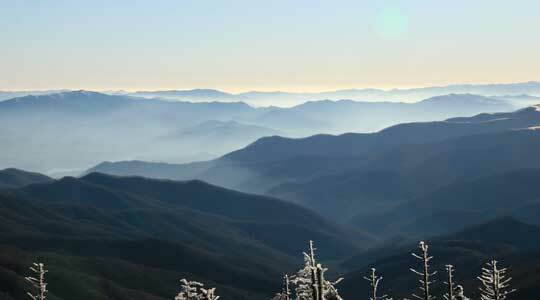 The gauzy mists of the United States Great Smoky Mountains have inspired writers and painters for centuries. But the source of these mists is less than poetic. “The Smoky Mountains are called smoky because of chemical emissions from trees,” said Jonathan Abbatt, a professor at the University of Toronto. Trees are often considered the lungs of the Earth, inhaling the greenhouse gas carbon dioxide (CO2), and exhaling harmless chemicals like water vapor and oxygen (O2). Trees give off other particles, however, that may not be so benign. Once in the atmosphere, these fine particles can transform into aerosols, a component of air pollution. In large amounts, these chemicals create a visible haze, when light is reflected off the tiny particles. However, it is not the mysterious appearance that causes concern, but the chemistry behind it. Although this haze may include chemicals from other sources, scientists have not yet been able to tell exactly how much. “There’s been a question about how much of those aerosol-forming chemicals are from trees, or biogenic, and how much are from people, or anthropogenic,” Abbatt said. Trees are supposed to clean the air, but might they be contributing to the amount of aerosols in the atmosphere, too? The chemicals trees give off, called volatile organic compounds (VOCs), are already common in the atmosphere. We tend to think of VOCs as an indoor air quality problem, being released when people paint, clean, or spray pesticides, or as the unhealthy smog that hangs over cities. Yet scientists estimate that trees and plants emit about two-thirds of the VOCs currently in the air. So if these compounds are already prevalent, why are they a problem? The natural VOCs produced by trees are not as toxic to human health as those emitted by paint and pesticides, which can cause headaches and irritate our eyes and lungs. However, once in the atmosphere, all VOCs react with other airborne chemicals to form air pollution. Abbatt and some of his colleagues at Environment Canada had noticed previous research suggesting tree emissions contributed to the atmospheric chemical mix. So they decided to conduct their own investigation in regions affected by forest emissions north of Toronto, Canada. Sorting out trees’ contribution to atmospheric haze was not easy, complicated by the fact that not all trees emit the same compounds. For instance, pine trees emit a class of chemical called terpenes—responsible for the trees’ sticky resin and pine scent. Terpenes are used to produce turpentine and furniture varnishes, as well as frankincense and myrrh. 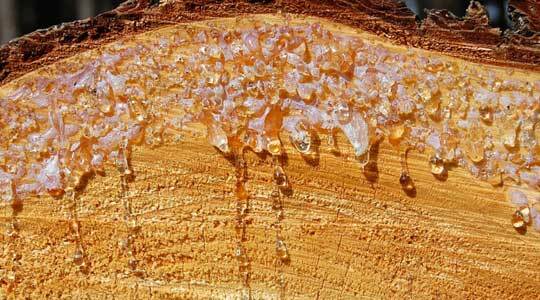 Deciduous trees emit isoprenes, a compound that is used to produce rubber. When emitted into the air and chemically transformed, these particles disperse as aerosols, which scientists can measure. Forests south of the city are mostly deciduous, and forests north of Toronto have more coniferous pine. If tree emissions contributed to air quality, the scientists should see higher amounts of terpenes. So they gathered air chemistry readings from one of Environment Canada’s research stations and compared the results to regional air quality models. They also looked at prevailing wind directions to determine whether their study site was being contaminated by man-made pollution blowing in from Toronto. After analyzing five weeks worth of data taken during the late spring and early summer of 2007, Abbatt and his colleagues indeed saw high amounts of terpenes. The site readings and models helped confirm the team’s theory, but the researchers wanted to know how widespread these particular pine emissions were. So Abbatt’s colleague, Randall Martin, a researcher at Dalhousie University, supplemented the station readings with remote sensing. His team turned to NASA archives, at NASA's Level 1 and Atmosphere Archive and Distribution System (LAADS) Distributed Active Archive Center (DAAC), to locate data from the Moderate Resolution Imaging Spectroradiometer (MODIS) instrument to see how much aerosols were in the atmosphere. They examined MODIS data collected over Ontario and Quebec, Canada, precisely during their study period, as well as before and afterward. He said, “The satellite data extended the ground results in space and through time.” The researchers could see that a vast swath of trees was emitting these chemicals. 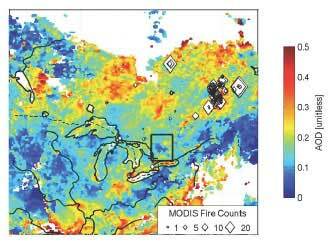 “MODIS provided evidence that this feature was not a local phenomena, but it extended over a large region of the Canadian forest,” Martin said. Scientists were already aware that trees emit chemicals into the atmosphere, but are just now beginning to understand the massive scale, and what might trigger these emissions. For instance, many trees emit chemical compounds as a defense against insect pests or predators, to help recover from damage, or to cope with weather and climate changes. Poison ivy releases chemicals to keep people and animals away, and walnut trees cope with stressful conditions by emitting an aspirin-like substance. During high temperatures, coniferous forests emit more terpenes to cool off and combat heat stress. The researchers’ study also provided clues about how these tree emissions might behave once in the atmosphere. Abbatt said, “Isoprene will form aerosols, but it just doesn’t form them as efficiently as terpenes.” Once in the atmosphere, both of these gases react with existing chemicals to form aerosols. However, because the pine forests north of Toronto emitted terpenes, they were responsible for producing more aerosols than the deciduous forests south of the city. Now that researchers have more consistent proof that trees emit VOCs, they are trying to spot similar emissions elsewhere. In fact, scientists from Environment Canada, with help from University of Toronto and Dalhousie University, have begun studying the forests around Whistler in British Columbia. Abbatt said, “They saw the same thing. There was this very warm period and the organic aerosol shot up.” Whistler is in such a remote location the researchers knew that outside pollution sources could not have caused the high aerosol levels they found. Slowik, J. G., C. Stroud, J. W. Bottenheim, et al. 2010. Characterization of a large biogenic secondary organic aerosol event from eastern Canadian forests. Atmospheric Chemistry and Physics 10:2,825-2,845, doi:10.5194/acp-10-2825-2010.